This A4 3-in-1 EcoTank printer provides an ultra-low-cost solution for photos, double-sided document printing, and more. This versatile A4 cartridge-free printer can produce double-sided documents and lots of photos at an ultra-low cost. It comes with up to three years’ worth of ink included in the box, saving you up to 90% on the cost of ink. It's hassle-free to use with an SD card slot, borderless photo printing and dual paper trays. It’s also easy to set up, reliable and designed for mess-free refills. Three whole years – that’s how long you could go without buying more ink for the L7160. This means you can save up to 90% on the cost of ink. It comes with enough ink to print up to 1,500 photos (10x15cm), and its ultra-high-capacity ink tank removes the need for cartridges. Print photos and double-sided documents with this five-colour ink system, which includes a black photo ink and black pigment ink. The printer includes an SD card slot, borderless printing, dual paper trays and LCD screen. 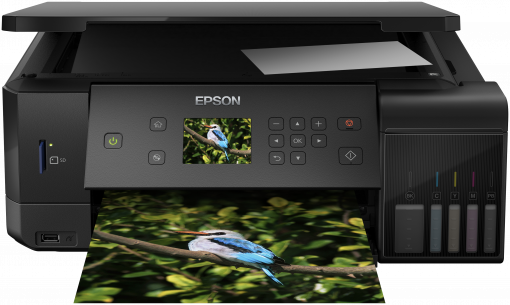 With Wi-Fi and Wi-Fi Direct, you can send files to print from smart devices using the Epson iPrint4 app. It's simple to make the most of your Facebook photos with the Creative Print4 app, which lets you print photos, and create greeting cards, colouring books and more. 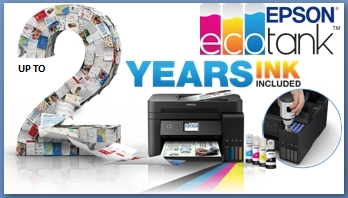 EcoTank provides a reliable printing solution with a one year warranty provided as standard, while promotional warranties may offer more.